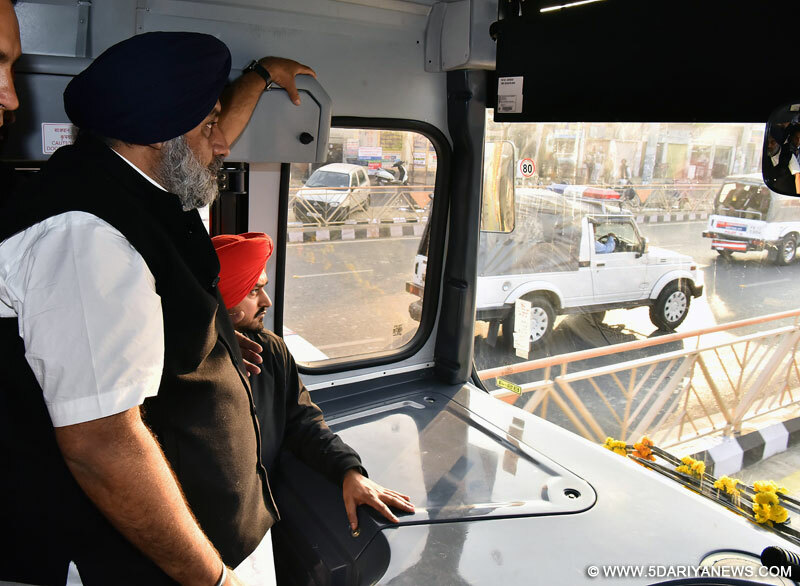 The transportation system today became witness to the revolutionary change when the Punjab Deputy Chief Minister, S. Sukhbir Singh Badal inaugurated the first phase of the prestigious ‘Bus Rapid Transportation System’ (BRTS) and dedicated it to the public. He said that this unique initiative would provide easy travel solutions to the people of holy city Amritsar. The Deputy Chief Minister also said that under this initiative air conditioned buses would ply on the 31 KM long special corridors which have come up on the pattern of metro system. Not only this, but specially designed ramps are also there for the differently abled people with provision for wheelchairs. The buses would be equipped with the GPS devices besides cameras and would be controlled by a central control room. He also said that this system would result in the people being saved from the traffic snarls apart from pollution. Earlier, addressing a vast crowd on the occasion of state level commemoration of Christmas, the Deputy Chief Minister congratulating the Christian community said that only the SAD-BJP government has the interests of all the sections of society at heart especially the minorities. He also divulged that the Punjab government has constituted Christian Development Board to look after the well being of the community. He also said that 5 marla plots would be provided to the homeless among the christian community regarding which the necessary instructions have been given to the concerned officials. S. Badal also disclosed that a member from the Christian community would be included in the District Level Grievances committees. He also promised that the community would have to face no difficulty in procuring BC category certificates and all the Deputy Commissioners have been given instructions for ensuring the same. Divulging more, he said that a budget of Rs. 100 crore has been kept for constructing graveyard for the Christian community out of which Rs. 50 crore have already been released. Making a pitch for development , the Deputy Chief Minister said that the state government has created an excellent road, rail and air connectivity infrastructure which has lead to the bolstering of trade on one hand and raising the standard of living of the people of state. He assured that every problem of the Christian community would be resolved on priority. Congratulating the christian community on the occasion, Revenue and Information and Public Relations Minister, Punjab, S. Bikram Singh Majithia said that the SAD-BJP government observes religious days of every community on the state and has implemented welfare schemes for the benefit of all sections of society. He said that before 1997, the occasion was not observed at the state level but the SAD-BJP government being truly committed to the ideals of secularism made it an article of faith to observe this sacred day at the state level. He also said that the SAD-BJP government would remain firm in its resolve to maintain communal harmony in the state and observe the religious occasions connected with every religion. Attacking Congress, S. Majithia said that this party always never cared for the religious sentiments of the minorities and exploited them and now PPCC President Captain Amarinder Singh is misleading people by promising smart phones just to bolster his electoral chances but the people of Punjab would not be deceived by the false promises of Captain.Among others present on the occasion included Ex-Cabinet Minister Sewa Singh Sekhwan, Manjinder Singh Sirsa, President District SAD Gurpartap Singh Tikka, Principal Secretary to the Deputy Chief Minister-P.S. Aujla, Deputy Commissioner Basant Garg, DIG A.K. Mittal, SSP Gurdaspur Jasdeep Singh and prominent leaders of the christian community.